There's nothing like a fresh approach to Australian politics. And what could be fresher than that of a former executive member of a peak Islamic religious body, a young man with degrees in engineering and law, the author of a book and a ton of op-eds who now lectures in politics at Monash University? 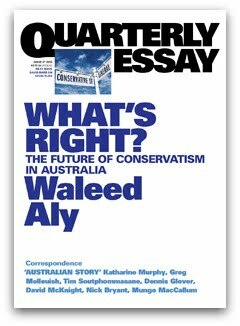 Waleed Aly tells us that his Quarterly Essay - What's Right? The Future of Conservatism in Australia - is not just a treatise about the strategic direction of Coalition parties but that it also delves deeper into the conservative movement and its philosophical and ideological underpinnings. Broadly, Aly argues that liberalism, with its emphasis on individual rights, added much-needed ideological flesh to conservatism which was historically allergic to ideology. Through the marriage of liberalism and conservatism, Aly shows how philosophies can sometimes collide and end up walking hand in hand. Problems arose, however, when, some 30 years ago, a vicious streak of market-obsessed neo-liberalism tried to force itself onto the two political lovers, the resultant conservatism morphed into the unreal, defending the indefensible and undermining the very foundations of both conservatism and liberalism. Aly says it all started in the Western world with Maggie Thatcher and the late Ronald Reagan, both of whom adopted the basic economic ideas of Friedrich Hayek. (Surprisingly, he doesn't mention influential neo-liberal economist Milton Friedman). In Australia, according to Aly, the neo-liberal revolution started in 1996 with the election of the Howard government. He is mistaken. In fact neo-liberalism was first adopted by the NSW Liberal government headed up by Nick Greiner and followed closely by the Victorian Liberal government of Jeff Kennett. In order for neo-liberalism to be preserved, climate change must, in the first instance, be denied ... The battle over the truth of climate-change science is therefore a political fight to the death for neo-liberalism. Aly cites Nick Minchin and even this colourful former Thatcher adviser in support of this claim but he doesn't mention Thatcher herself, who, as far back as 1990, was under no illusions about the science of climate change or its consequences for environmental, economic and broader government policy. Now to Aly's critique of modern neo-conservative liberalism's approach to multiculturalism. Aly takes the Howard government to task for its rhetoric toward Muslim communities in particular and migrants in general which was ostensibly about "integration" and social cohesion, but applied with alarming inconsistency. Hence Brendan Nelson can tell Muslim independent schools to "clear off" unless they teach Australian values but can still dish out millions to schools run by the Exclusive Brethren. 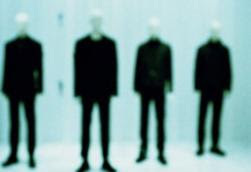 ... the cultural politics of neo-conservatism very quickly resort to a kind of groupism, prosecuting an identity politics of collectivism ... not simply the dispassionate application of a political philosophy ... a reactionary, combative doctrine that seeks out enemies it can destroy. Muslims have in no way suffered the kinds of deprivations suffered by Australia's Indigenous peoples. On that basis, a prominent former spokesman for a Muslim peak body should surely recognise the greater injustice and identify the greater ideological evil. Aly's response? So we should be wary of accusing conservatives of racism when they refuse to apologise to the stolen generation, even if they're inconsistent and have no reluctance to apologise to white stolen kids? Aly unpacks conservative rhetoric and it's underlying philosophy when used to prosecute one form of oppression and yet excuses the same process when used to execute and justify an even greater oppression. When it's done to migrants (especially Muslims), it is irrational, ideologically-charged prejudice but when much worse is done to those who have occupied this land for 400 centuries, it can have some philosophical justification and should not necessarily be seen as racism. Muslims did suffer severe headaches and a fair few civil rights infringements during the Howard era, all in the name of national security. But Muslims have never had their social security benefits quarantined on the basis of their ethnic or religious identity. Muslims were not subject to a severe intervention which could only be implemented by suspending the operation of the Racial Discrimination Act and Muslims have not had their children stolen from them as part of a deliberate government policy. Aly's inconsistency reflects a lack of empathy we sadly see all too often among defenders of multiculturalism, especially current and former "ethnic" leaders. Today's migrant brown man complains of the white man's prejudice toward him but neglects to recognise the responsibility of both white and brown migrants toward the continued dispossession of the original Australians. Muslim leaders should not expect empathy when they do not empathise toward those who have suffered much more and for much longer. Those sympathetic to Aly's Muslim advocacy might also be uncomfortable with his deep reverence for Howard-s ideas. Indeed, Aly's admirers from that nebulous ideological place often referred to as "the Left" will be shocked to read him state that "the liberal and conservative traditions contain indispensible wisdom for the functioning of our politics." They might conclude, as I have, that Aly is finally confessing his own deep conservatism. To be fair, what Aly reveres in the likes of Howard and Abbott (and what I also recognised in Abbott) is their commitment (or at least lip service) to basic conservative principles, not policies and programs. These principles can lead to policy outcomes with which people on both sides of the political spectrum will be comfortable. Conservatives like decentralised power, gradual evolutionary change, not revolution. They are cautious and prefer the status quo without becoming captive to what Aly calls "reactionary nostalgia". Anti-racism is thus an inherently conservative idea, even if it has not been associated with contemporary manifestations of conservatism. Aly's historical and philosophical range is impressive: the industrial revolution, the development of liberalism and its marriage to conservatism; and the more recent morphing of conservatism into neo-conservatism via a marriage with market-obsessed neo-liberalism. That said, by the time I reached page 64 of this 105-page essay on the future of conservatism, I wondered when - and indeed whether - we would actually reach the Australian present, let alone the future. I flicked to the "Sources" section where Aly presents his references. There are plenty of references to Edmund Burke, John Stuart Mill, Friedrich Hayek and others. Also mentioned were Michael Oakeshott, former UK Guardian journalist Melanie Phillips and even American neo-con Irving Kristol. One surprising omission was Tony Abbott's Battlelines which was launched in late July 2009, probably before Aly first put pen to paper for his Quarterly Essay. One needn't agree with everything Abbott's book has to say (Lord knows I certainly don't), but it strikes me as extremely ambitious on Aly's part to even attempt to write about domestic conservative futures without exploring a comprehensive treatise of one of its prominent practitioners. Instead, Aly's discussion of the current Federal Coalition leader is limited to some speeches and articles where Abbott discusses multiculturalism, Muslims and climate change. But exactly how is this de-and-reconstruction of conservatism to be achieved? After reading Aly's essay, I'm still not sure. His broad brush of history, economics and political philosophy hovers around the topic but never quite nails it. He has little to say on what is billed as the central theme of his essay except a confession at the top of page 96 that: "I am not optimistic." And if Aly's conservative prescription is followed, Indigenous Australians need not be optimistic either. This review was first published in NewMatilda.